Having not eaten any fries... This is what I got from McD's. When did they stop filling the fries up to the top? 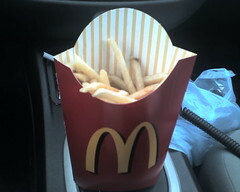 Guess McD's is trying to say you're too fat, this all fries you will get. heard a manager tell an employee they put too many fries into the container "don't fill them so much"
we're keeping the same pricing as before but we're making the packaging amount smaller.